↑ 1.0 1.1 1.2 1.3 O'Luanaigh, C. (14 March 2013). "New results indicate that new particle is a Higgs boson". CERN. สืบค้นเมื่อ 2013-10-09. ↑ 2.0 2.1 Bryner, J. (14 March 2013). "Particle confirmed as Higgs boson". NBC News. สืบค้นเมื่อ 2013-03-14. ↑ 3.0 3.1 Heilprin, J. (14 March 2013). "Higgs Boson Discovery Confirmed After Physicists Review Large Hadron Collider Data at CERN". The Huffington Post. สืบค้นเมื่อ 2013-03-14. ↑ ATLAS; CMS (26 March 2015). "Combined Measurement of the Higgs Boson Mass in pp Collisions at √s=7 and 8 TeV with the ATLAS and CMS Experiments". arΧiv:1503.07589. ↑ LHC Higgs Cross Section Working Group; Dittmaier; Mariotti; Passarino; Tanaka; Alekhin; Alwall; Bagnaschi; Banfi (2012). "Handbook of LHC Higgs Cross Sections: 2. Differential Distributions". CERN Report 2 (Tables A.1 – A.20). 1201: 3084. arXiv:1201.3084. Bibcode:2012arXiv1201.3084L. ↑ Onyisi, P. (23 October 2012). "Higgs boson FAQ". University of Texas ATLAS group. สืบค้นเมื่อ 2013-01-08. ↑ 7.0 7.1 Strassler, M. (12 October 2012). "The Higgs FAQ 2.0". ProfMattStrassler.com. สืบค้นเมื่อ 2013-01-08. [ถาม] ทำไมนักวิทยาศาสตร์อนุภาคจึงสนใจมากเกี่ยวกับอนุภาคฮิกส์? ↑ Strassler, M. (8 October 2011). "The Known Particles – If The Higgs Field Were Zero". ProfMattStrassler.com. สืบค้นเมื่อ 13 November 2012. The Higgs field: so important it merited an entire experimental facility, the Large Hadron Collider, dedicated to understanding it. ↑ Siegfried, T. (20 July 2012). "Higgs Hysteria". Science News. สืบค้นเมื่อ 2012-12-09. In terms usually reserved for athletic achievements, news reports described the finding as a monumental milestone in the history of science. ↑ Del Rosso, A. (19 November 2012). "Higgs: The beginning of the exploration". CERN Bulletin. สืบค้นเมื่อ 2013-01-09. Even in the most specialized circles, the new particle discovered in July is not yet being called the “Higgs boson". 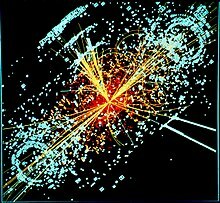 Physicists still hesitate to call it that before they have determined that its properties fit with those the Higgs theory predicts the Higgs boson has. ↑ Naik, G. (14 March 2013). "New Data Boosts Case for Higgs Boson Find". The Wall Street Journal. สืบค้นเมื่อ 2013-03-15. 'We've never seen an elementary particle with spin zero,' said Tony Weidberg, a particle physicist at the University of Oxford who is also involved in the CERN experiments. ↑ Overbye, D. (8 October 2013). "For Nobel, They Can Thank the 'God Particle'". The New York Times. สืบค้นเมื่อ 2013-11-03. ↑ Overbye, Dennis (15 December 2015). "Physicists in Europe Find Tantalizing Hints of a Mysterious New Particle". New York Times. สืบค้นเมื่อ 15 December 2015. ↑ Lee, Benjamin W.; Quigg, C.; Thacker, H. B. (1977). "Weak interactions at very high energies: The role of the Higgs-boson mass". Physical Review D. 16 (5): 1519–1531. Bibcode:1977PhRvD..16.1519L. doi:10.1103/PhysRevD.16.1519. ↑ "Huge $10 billion collider resumes hunt for 'God particle' - CNN.com". CNN. 11 November 2009. สืบค้นเมื่อ 4 May 2010. ↑ Rincon, Paul (13 December 2011). "LHC: Higgs Boson 'may have been glimpsed". BBC. สืบค้นเมื่อ 13 December 2011. ↑ "CERN experiments observe particle consistent with long-sought Higgs boson". CERN. 4 July 2012. สืบค้นเมื่อ 4 July 2012. ↑ "Observation of a New Particle with a Mass of 125 GeV". Cms.web.cern.ch. สืบค้นเมื่อ 2012-07-05. ↑ "ATLAS Experiment". Atlas.ch. 2006-01-01. สืบค้นเมื่อ 2012-07-05. 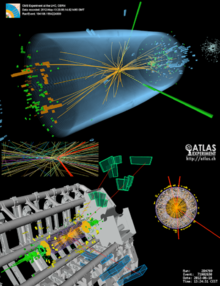 ↑ Video (04:38) - CERN Announcement (4 July 2012) Of Higgs Boson Discovery. ↑ Overbye, Dennis (July 4, 2012). "A New Particle Could Be Physics' Holy Grail". New York Times. สืบค้นเมื่อ July 4, 2012. ↑ "Broken Symmetry and the Mass of Gauge Vector Mesons". ↑ "Broken Symmetries and the Masses of Gauge Bosons". (อังกฤษ) Why the Higgs particle is so important! หน้านี้แก้ไขล่าสุดเมื่อวันที่ 15 มิถุนายน 2559 เวลา 01:03 น.